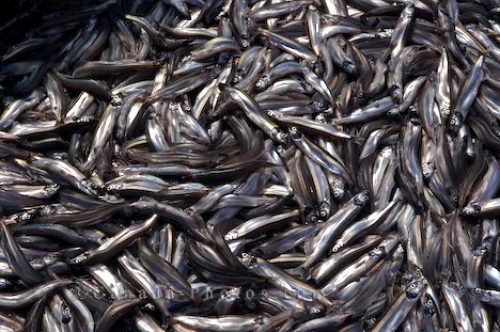 Millions of Capelin find themselves beached at Admiral's Point in Trinity Bay in Newfoundland Labrador as spawning season nears. The coastline is blanketed with the fish as their silver bodies glisten in the sunlight which also attracts many birds, other fish and many types of marine mammals where they can easily find a quick meal. Picture of the beached Capelin fish at Admiral's Point in Trinity Bay in Newfoundland Labrador during spawning season.